I reformatted this so the most interesting parts of the brochure could be showcased in one composite. 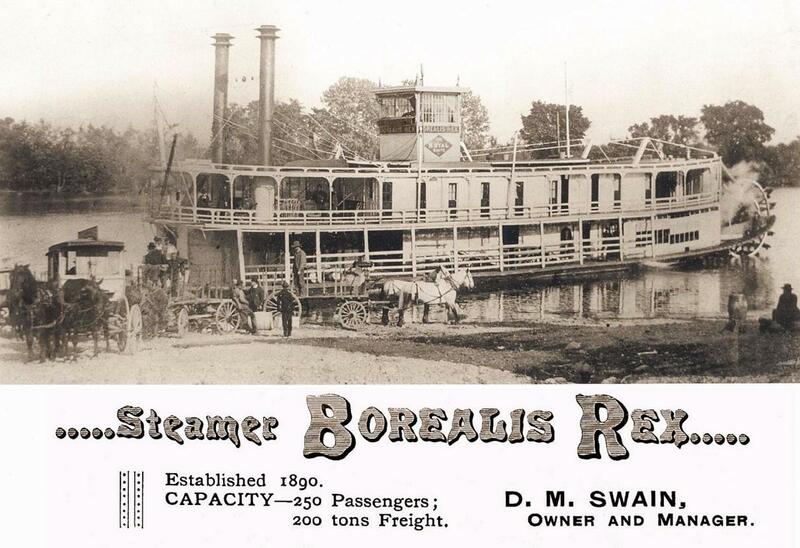 Operated around Stillwater, Minnesota until 1890 when she was brought to the Peoria-La Salle trade on the Illinois River under command of Captain Charles Ebaugh. 1903, Captain George Prince ran her out of Natchez twice weekly. One trip to Atchafalya, the other to the Black, Ouachita, Tensas and Little rivers. Several years later she was sent to Lake Charles, Louisiana, but a modern highway ended her trade. Moored for a time at the foot of Pugo Street in St. Charles, Louisiana, and idled until sold for junk in 1938 for only $110. I restored this flyer a lot from a thin 5.60 x 9.85 inches paper it was printed on and replaced the poor quality photo that was printed on it originally with a better one from LaCrosse. Formerly CITY OF WINONA and renamed in 1905 after being rebuilt. Named in honor of Captain Walter Wisherd. The W.W. and the J.S. 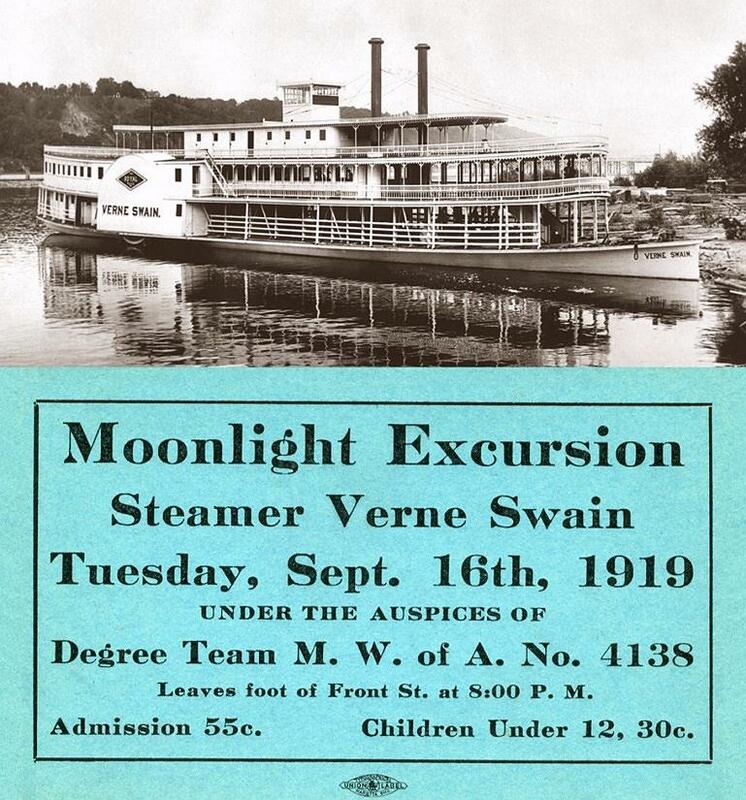 were popular excursion boats on the upper Mississippi River. Captain Rounds bought the W.W. in 1917 to replace the GOLDEN GIRL. She ran excursions and in the summer of 1918 was in Nashville, Tennessee. In 1920 owner John Klein used her to tow barges loaded with pipe from the upper Ohio to the lower Mississippi. In 1921 she was bought by Captain Gaches who used her to tow his showboat. 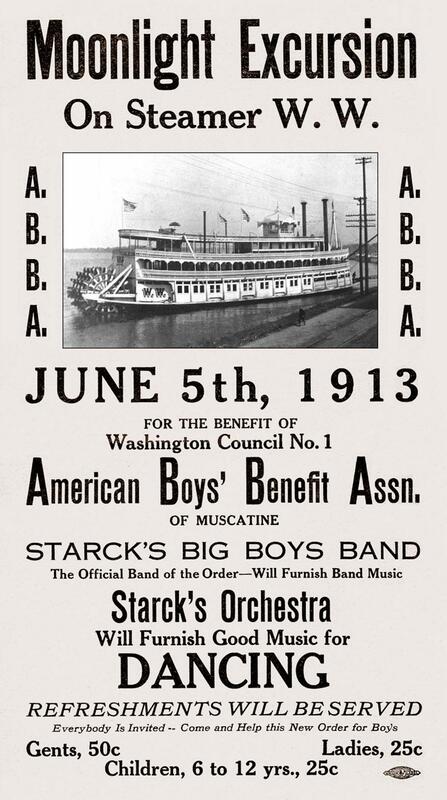 The show was boycotted at one point by people of of Crown Hill, West Virginia who assumed that the name of the boat, "W.W.," stood for Woodrow Wilson. Captain Gaches replied that the initials stood for "Western Waters" and so the show went on. Sank and lost during a windstorm at the head of Brush Creek Island on the Ohio River in the spring of 1922. 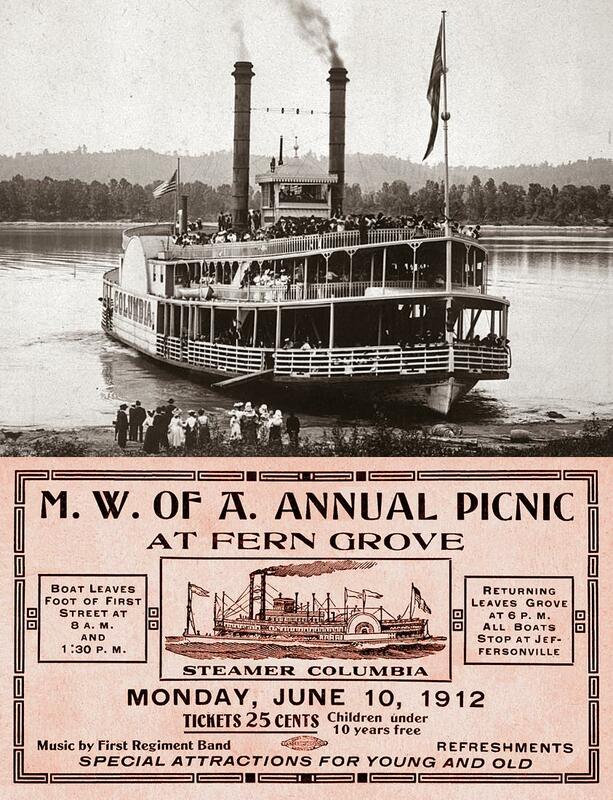 Card announcing an excursion from Louisville, Kentucky to a picnic at Fern Grove which was located on the Ohio River at the mouth of Fourteen-Mile Creek near Charlestown, Indiana. M.W.A. apparently stands for Modern Woodmen of America, founded in 1883 as "a fraternal benefit society that protected families from financial hardship after the death of a breadwinner." Her engines and doctor came from the NEW SHALLCROSS. The fire that destroyed her Jeffersonville, Indiana on January 20, 1913 was discovered by watchman George Canary while the COLUMBIA Columbia was in her winter quarters at the foot of Watt Street in Jeffersonville, Indiana. 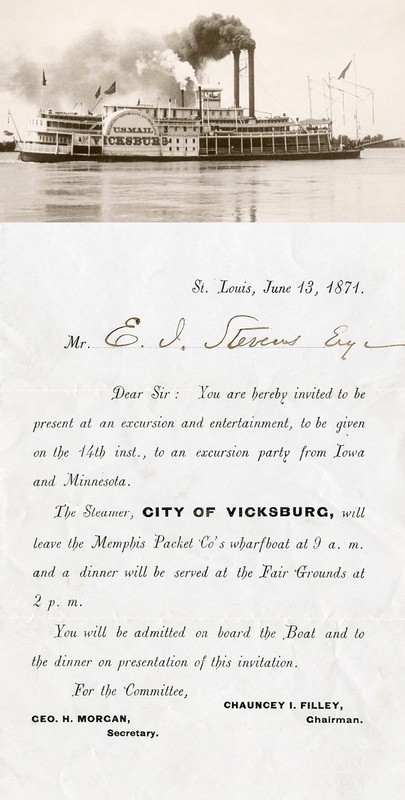 Invitation date June 13, 1871 to Mr. E.L. Stevens announcing an excursion party and dinner to be given the following day for visitors to St. Louis from Iowa and Minnesota aboard the CITY OF VICKSBURG. Home port or owner's residence (Anchor Line) circa 1881, St. Louis, Missouri. Sold 1898 to John T. Hardy Sons and Company, New Orleans and rebuilt into the CHALMETTE. Built in 1913 at Stillwater, Minnesota by Captain David M. Swain built her to replace the FRED SWAIN. 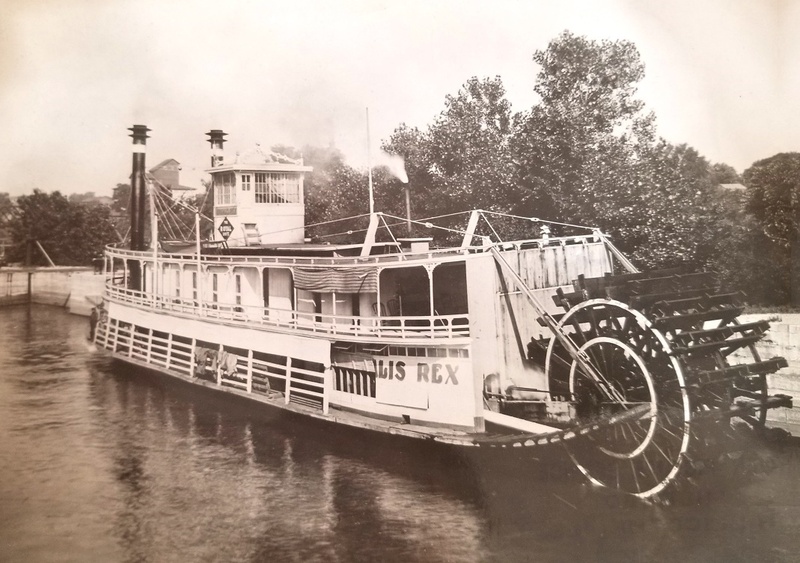 She ran excursions on the Illinois River until she was sold to Fred Hornbrook in the spring of 1918. Captain David Swain died delivering this boat to Pittsburgh in July, 1918. Captain Hornbrook ran her in the Pittsburgh-Wheeling packet trade. In 1923 Captain J. Orville Noll ran excursions with her in the Wheeling area for the Anchor Line until March 1927. 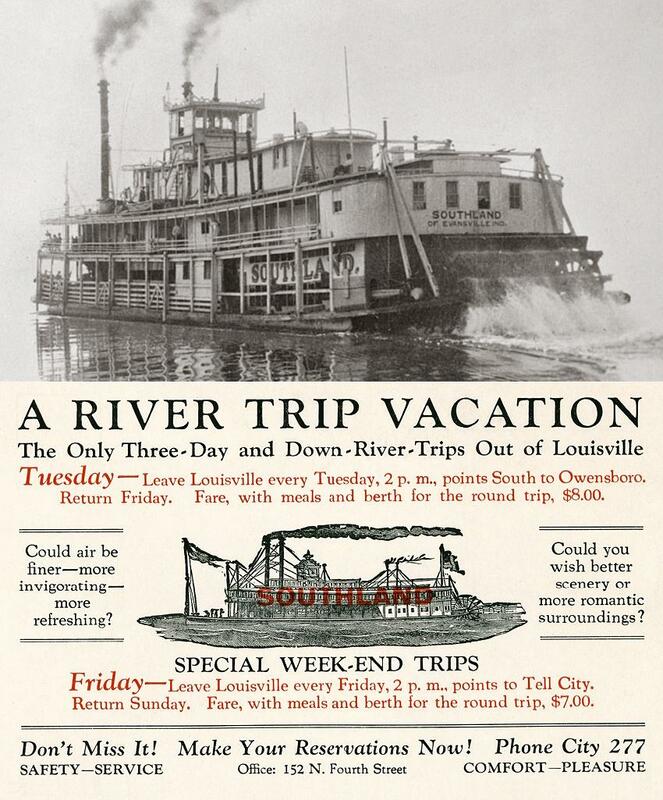 Subsequent owners included D. B. G. Rose, Louisville, Kentucky who renamed her ROSE ISLAND and the Pittsburgh Amusement Company, Captain Griffith W. Shaw and others, who renamed her ROOSEVELET in 1929. Circa 1932 she was called City CITY OF MEMPHIS. Louisiana is on the Mississippi downriver from Hannibal, Missouri (boyhood home of Sam Clemens). While passing through the drawbridge at Quincy, Illinois on March 27, 1870, she hit the ice breaker and lost her port wheel, blacksmith shop, pantry, and lower guard but landed safely. On February 28, 1871 while leaving St. Louis, the head of a mud drum blew out killing a fireman and two camels belonging to Van Amburgh's menagerie. She snagged and sunk on June 2, 1874 near Alton, Illinois while bound down river. 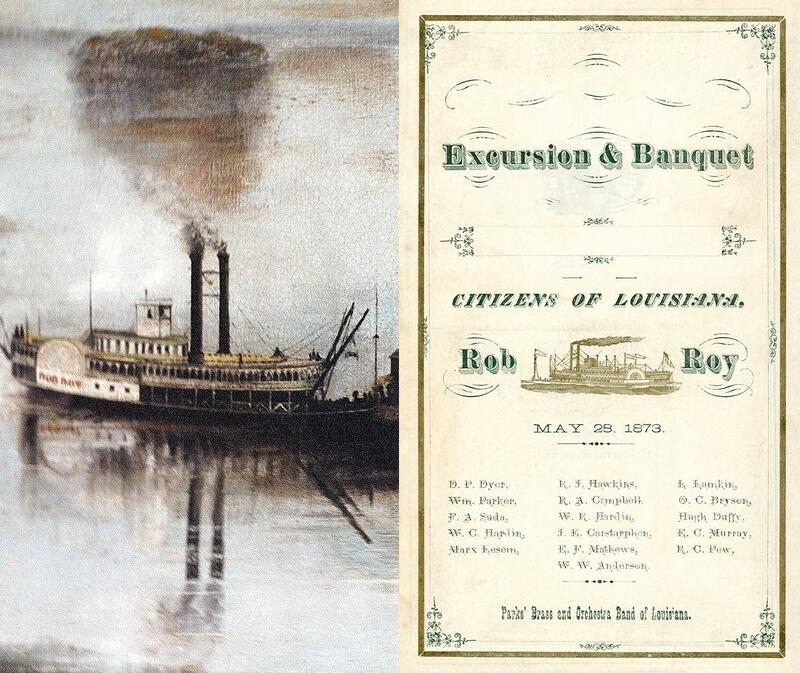 On February 26, 1880 she sank after hitting an obstruction below Louisiana, Missouri. She was raised and was to be dismantled when the GOLDEN EAGLE burned. The ROB ROY had just been brought out of retirement in late that summer when she broke a gib on the starboard engine crosshead on the inboard stroke and knocked out the cylinder head; subsequently the ROB ROY was dismantled before the end of 1880. On the left is a detail of the ROB ROY from an 1869 painting "Down River View of the Mississippi and Hannibal, Missouri Landing"
George L. Crosby, born in Massachusetts in 1833, travelled west as a young man with settlers bound for Kansas. His impressions of that expedition were recorded in two paintings, "Kansas or Bust" and "Kansas and Busted". After his return to Massachusetts he was commissioned by investors in the Hannibal and St. Joseph Railroad to paint views of Hannibal and the surrounding terrain. Crosby married in Hannibal, returned to Marlborough, Massachusetts, and came back to Hannibal in the 1860's where he was active as a photographer and portrait painter until he and his family were drowned in a flash flood of 1877 or 1878. Circa 1980 from a restaurant that was located on top of the Quality Inn Riverview across the Ohio River from Cincinnati, Ohio. Owned and operated by Frisch's Restaurants of Cincinnati. SWEET CHANNEL (Desserts): New Orleans Crepes - River Queen's Treat of the Day "Ask your mate"
We'll be underway the moment you step on to the outer ring of our elegant traveling restaurant. Make yourself comfortable as we transport you smoothly away from your cares and anxieties. Drink in the panoramic sweep of hills and valleys, the teeming river, the city's skyline, the quaint red rooftops and the green hillsides of Kentucky. Relax and allow one of our friendly mates to bring you food and drink fit for such a world traveler as you." When Florence Ziegfeld opened Jerome Kern's musical adaptation of Edna Ferber's SHOW BOAT in December, 1927 he had a fictional broadside for the showboat COTTON BLOSSOM's production of THE PARSON's BRIDE enclosed inside each program for the production with husband and wife "stars" Julie LaVerne as "Lucy" and Steve Baker as "Parson Brown" who are scheduled to appear in a performance in Natchez, Mississippi that evening. A spurned admirer of Julie's on the showboat informs local law enforcement in Natchez that Julie's mother was African American while Steve is white and miscegenation is illegal in Mississippi (marriage between different races) so Captain Andy Hawks is obliged to dismiss Julie and Steve. Captain Andy replaces Julie with his own daughter Magnolia in the role of "Lucy" and replaces Steve with the wandering gambler Gaylord Ravenal as "Parson Brown." Andy's wife Parthy disapproves of Ravenal as a suitor for her daughter but there's a mutual attraction between him and Magnolia. Thus begins the story. 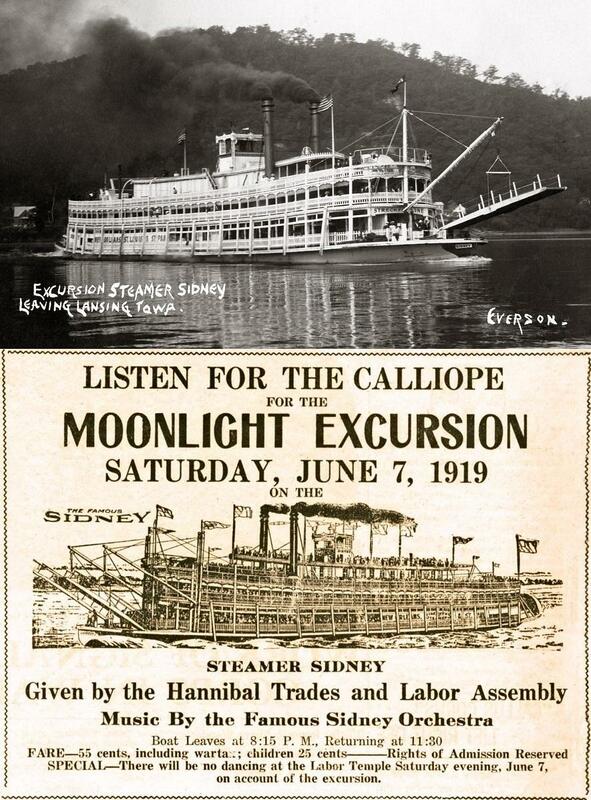 STEAMER SIDNEY and moonlight excursion ad from the Hannibal Labor Press newspaper for June 7, 1919. 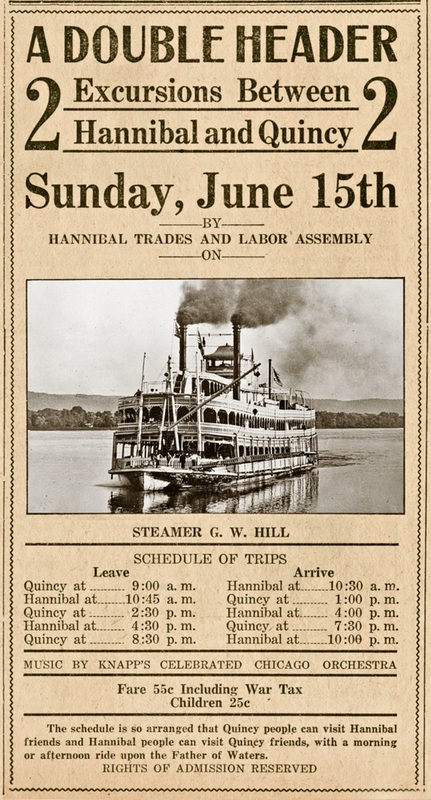 Ad in the Hannibal Labor Press for 2 cruises aboard the G.W. HILL on SUNDAY JUNE 15, 1919. Home port or owner's residence circa 1909, St. Louis, Missouri. Converted into an excursion boat in May 1912. 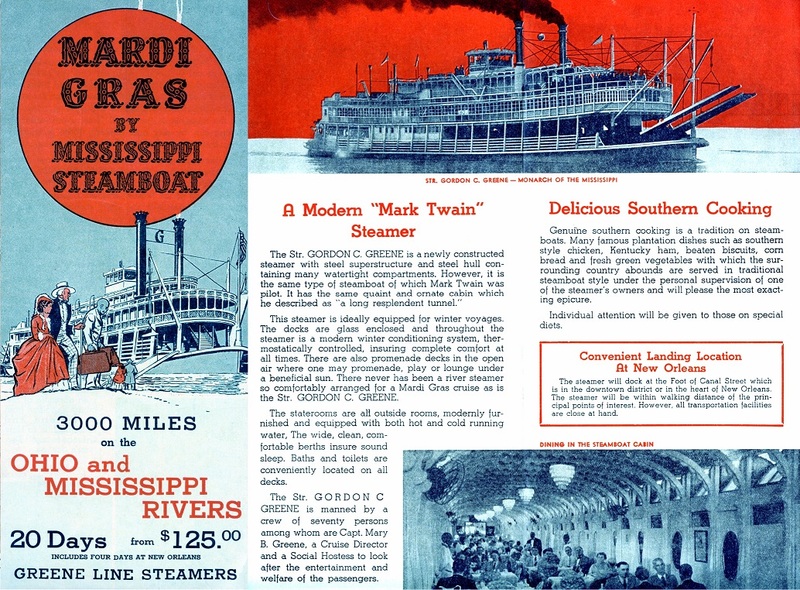 After World War I she commenced tramping to the upper Ohio River, she also went to New Orleans, Pittsburgh, etc., until sold in 1923 after the steamboat fire at Cincinnati, Ohio (November 4, 1922) and renamed the ISLAND MAID.